Contact our PartyMojo office at 65696992 / Sales 81606655 / Yolanda 81606622 to enquire now! Drop us a quick email at [email protected] today for your very own burger station! Summer’s just around the corner and PartyMojo is all fired up for your next big party! Feeling the heat yet? That must be PartyMojo’s Live Burger Station. YES! Right at the core of your double quarter party! We at PartyMojo can’t wait to share this scrumptious, juicy, grease-dripping delight with you! If you’re craving to sink your teeth into soft, tender meaty burger with a crunch of awesomeness, ding-dong! PartyMojo brings our Live Burger Station to you for you to share all this goodness with your friends and family, at the convenience of your own space. What are you waiting for? Get ready, get set, grab fries! PartyMojo strikes back with burg, burger, burgest deals of all time! We understand little lollies and gummies sweet are fancy without a doubt, but they might just not settle. Something’s missing… Well, don’t let small minds tell you your dreams are too big because, with PartyMojo, we follow your dreams! Dream big, dream BURGERS! Our Live Burger Station is where your dreams come true! We bring it right to you! Equipped with one solid stunning dream-catcher of a MojoChef, PartyMojo’s Live Burger Station will be cooking with non-stop drool-worthy burgers that keep you and your friends coming back for more! Our hot and delicious burgers are available in both chicken and beef patties options! Savour every bite of PartyMojo’s chunks of intense juicy burgers with friends and family today! What’s required from me if I hire PartyMojo’s burger live station? Simply provide us a table and a powerpoint and we’re good to go! What does the live station includes? Professional live station set up, 2 x young and lively manpower, burgers! What’s the duration of the live station? We serve about 100 servings in an hour! I need to cater to 500 people in an hour, can you do it? No problem! We can cater to as many people as you want in the hour. This can be done so by adding more stations and manpower! Simply call or email to enquire with your event details and you will get a quotation within a day! Burger at your party events! A fresh beef patty grilled to a sizzling tender goodness, laid with a few slices of lettuce and tomatoes then rdonned with a coat of warm melted cheese and finally sandwiched between two golden buns sprinkled with aromatic sesame seeds that completes the classic burger. Feeling the temptations of taking a bite? Bet your guests will feel the same way! Burgers are so basic and common but they win our heart every time as our favourite fast food craving. When deciding on food catering for your event, this is one food that you simply cannot miss! So what are you waiting for? Have PartyMojo’s Burger Live Food Station for your next event! Bombs away for a truly burgery gourmet experience! How are our burgers served? Like all other foodies who are serious about savouring what they put in their mouths, we believe that good food should be consumed fresh! That’s right! We make sure that only newly arrived ingredients are used. They are sealed and frozen before being transported to your event to be pieced together for the perfect burger. Our Burger Live Food Stations at your event will make your burgers as and when you place your order so that they are once again as fresh as they can get! All you have to do is just sit back and enjoy! 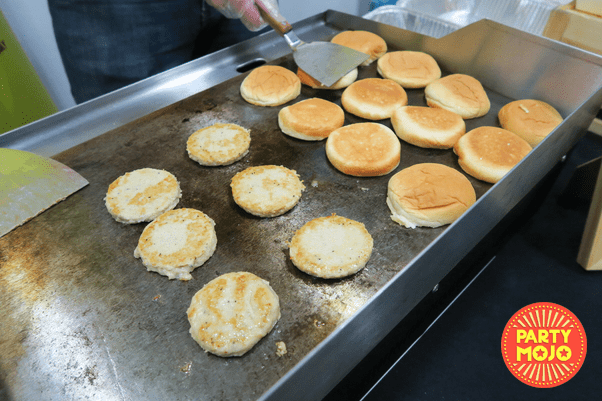 Why have Burger Live Food Station at your events? The burger is an American staple with 50 billion burgers consumed every year. Today, the burger has been widely popularised around the world just like American pop culture. People love it so much as it’s more appetising than a sandwich and more convenient to make and consume than a full piece of steak at the same time. If you look up the menu of any restaurants or cafes serving western cuisines in the market, it is almost impossible to miss the burger on the list. Convinced that you should have burgers at your event? Bet you are! Contact PartyMojo today to satisfy your guests with our Burger Live Food Stations at your next event. It’s pretty easy to find burgers that cost as low as a dollar in the US and the burger certainly doesn’t leave you the impression of a sophisticated food. It simply costs too little to be taken seriously, or does it? Well then you probably would not have heard of the burger made of black truffles, foie gras and Kobe beef and served with 1990 Chateau Petrus that is priced at 5000 USD. Sounds fancy doesn’t it? Now you might find it appropriate to add the burger to your catering list to add some class to your event. We can’t deliver 5000-dollar burgers to your guest for sure but rest assured of the quality and consistency in our burgers freshly made by our Burger Live Food Station. 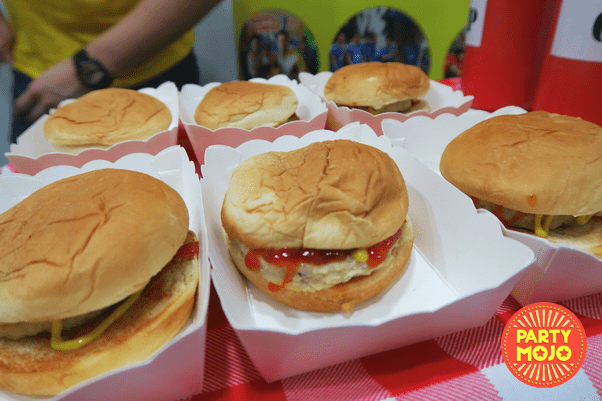 Enquire with PartyMojo today at 6569 6992 or 6569 6998 about catering our burgers for your next event!